Runners get a chance to run through green, tree-lined city parks, cross bridges over the Colorado River, and trek through Austin’s city streets and neighborhoods at the Austin Marathon, Half Marathon & 5K, which saw more than 8,100 runners cross the finish line at the 2016 running of the race in the half-marathon alone out of more than 12,000 in all races combined. Both full marathoners and half-marathoners start their race at the same starting line, at the corner of 2nd Street and Congress Avenue in downtown Austin, just blocks from the bridge across the river. From there, runners follow the route from a starting elevation of around 460 feet above sea level and climb nearly 200 feet over the first two and a half miles, running along Congress and turning on Lightsey Road and 1st Street as they make their way back toward the river. The course crosses the Colorado for a second time between mile markers 6 and 7, which coincides with the flattest stretch of the race between miles 6 and 8. This flat, fast and even couple of miles take runners along the riverbanks along Cesar Chavez Street and Stephen F. Austin Drive, and through the city’s Town Lake Metropolitan Park. After making their way through the park, runners stay on the road that becomes Lake Austin Boulevard, which parallels the river and runs past Lions Municipal Golf Course before meeting up with Enfield Road, where runners turn back in toward the city. The last few miles of the race along Enfield Road are a straightaway that also brings a long, steady uphill stretch. Once Enfield gives way to 15th Street, runners begin the last mile of the race, a slightly uphill stretch that takes them along San Jacinto and Congress for the finish at 2nd Street. The finishing elevation for the race is just over 500 feet above sea level, for a climb of nearly 200 feet in elevation over the course of the race for those running in the half marathon. Participants in the half will have 4 hours to complete the race (which means they’re expected to keep at least a 19-minute-per-mile pace). Along the way, you’ll get to see many of the city’s most notable sights and attractions, including the Texas State Capitol building, the campus of the University of Texas and the downtown parks through this mecca of hippie, chic, stylish, intellectual and musical influences. Located among the South Texas hill country and bisected by the Colorado River that flows through the center of town, Austin typically enjoys mild to moderately cool weather conditions in the mid-winter season, with relatively scarce rainfall. In February, temperatures average between 44°F and 65°F, while rainfall amounts average just under 2 inches, making February its third-driest month of the year. On the day of the race (Feb. 17), the average low is 44°F and the average high is 65°F. See the race route map for the Austin Half Marathon here. Yes, for the half marathon and the full marathon — walkers must be able to complete the half marathon within 4 hours, or the full marathon within 7 hours. To reserve your spot in the 2019 running of the Austin Marathon, Half Marathon or Paramount 5K race, register online at eventdog.com here. 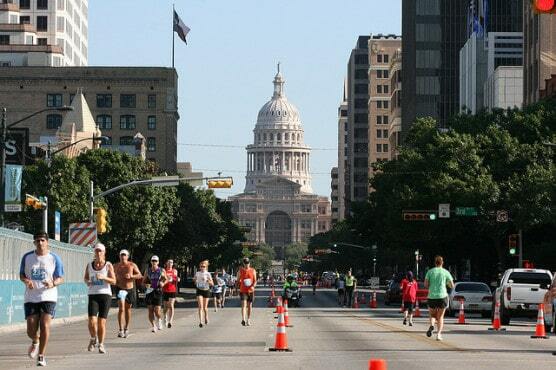 Ever run in the Austin Half Marathon? Share your impressions here, or post your review in the Comments box below. Are jogging strollers allowed on the course?